Pristine Fijian ecosystem at land and sea, romantic and evocative South Pacific vistas and lifestyle… no wonder a trip to one of the world's top exotic tropical destinations is on nearly every travel bucket list. For diving and snorkeling enthusiasts, it should be at the top. 'Cousteau' is possibly the most renowned name in diving, oceanography and advocacy for our planet's oceans. 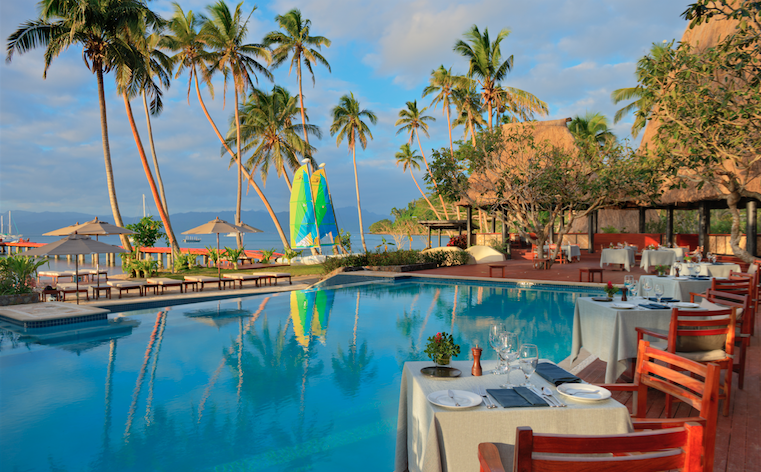 The Jean-Michel Cousteau Resort in Fiji continues the fabled marine and conservation Cousteau legacy. Located on 17 pristine acres on the second-largest of Fiji's 300+ islands in a marine protected area, it's the ultimate diving resort destination in the South Pacific and among the most acclaimed in the world. Drawing on Jean-Michel Cousteau’s expertise, the resort has established a unique reputation for providing access to the best dive sites in Fiji and the South Pacific. The Jean-Michel Cousteau Dive Centre is one of the premier dive destinations in the world. It's minutes from exciting dive sites and only half an hour to the world-class Namena reef. 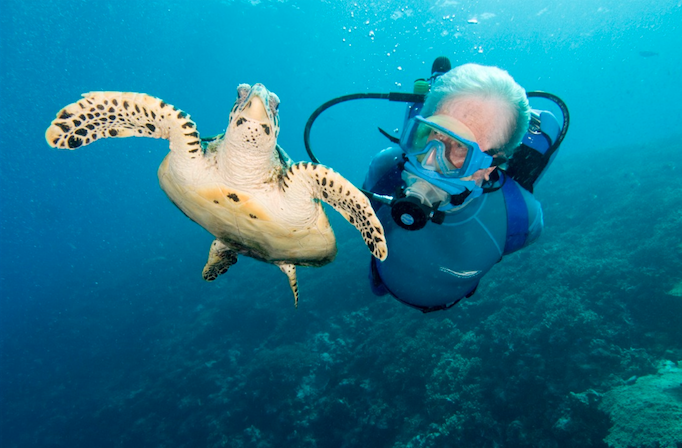 Jean-Michel Cousteau himself, and the conscientious practices of the Dive Centre, are among the leaders in Fiji's dedication to maintaining Fiji as one of the world’s premiere travel destinations with a pristine ecosystem that can support the globe’s overall adaptability to climate change as a blue carbon sink. Diving is icing on the cake. The award-winning, eco-luxury resort brings together five-star hospitality, sustainability, and celebration of the local culture as well as the lands and waters surrounding it. It's an exclusive escape in French Polynesia for travelers seeking that once-in-a-lifetime experience – even if you aren't a diver. Picture a wedding, vow renewal, or romantic escape in paradise. Families will love the children's programs that engage kids in the extraordinary environment. Anyone's travel imagination will thrive surrounded by the beauty of the green-forested mountains, wafting palms and breathtaking beaches, as well as the interaction with Fiji's untouched culture. 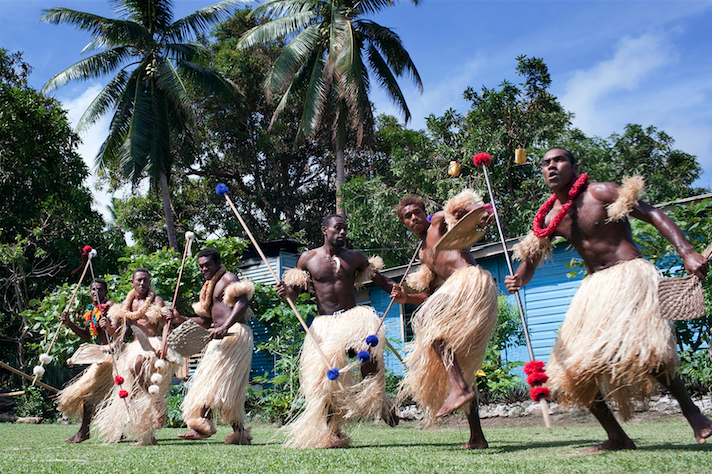 Guests are welcomed in Fijian style and accommodated in 25 individual 'bures' – traditional thatched Fijian buildings – crafted from local, and sustainable, timbers. Along with privacy, an incredible scenic view of the island's sunsets, private patio and the walkout into the grounds, each bure is a dreamy tropical escape: rattan furniture, king-sized bed, wooden louvers, overhead fans. There's even a 2000-square foot Villa: a grand bure featuring a master suite, indoor/outdoor patio, private infinity pool, Jacuzzi tub, waterfall and outdoor showers. To complete your escape to Polynesian island tranquility, there are no phones or televisions in the bures. Concierge and room services ensure your every need is taken care of. Guests have opportunities for hiking, kayaking, tennis, volleyball, excursions to a tropical rain forest, and local crafts. Relax or workout in one of the resort's three pools. Start your day with complimentary morning yoga in the yoga pavilion, the gardens, or on the beach. Fijian-style relaxation goes a step further with spa services. Treatments are available in your own bure or in the resort's beachside spa bures - in the sand at the water's edge with complete privacy and inspiring views of the sea and dramatic hills. Intimate, relaxed, upscale, elegant dining against a scenic ocean backdrop. The resort's restaurant features local cuisine as well as Asian and European influenced dishes. There's a weekly 'Lovo' traditional Fijian feast cooked Polynesian-style in a ground oven. And of course, an all-day bar with premium local and international cocktails and wines. 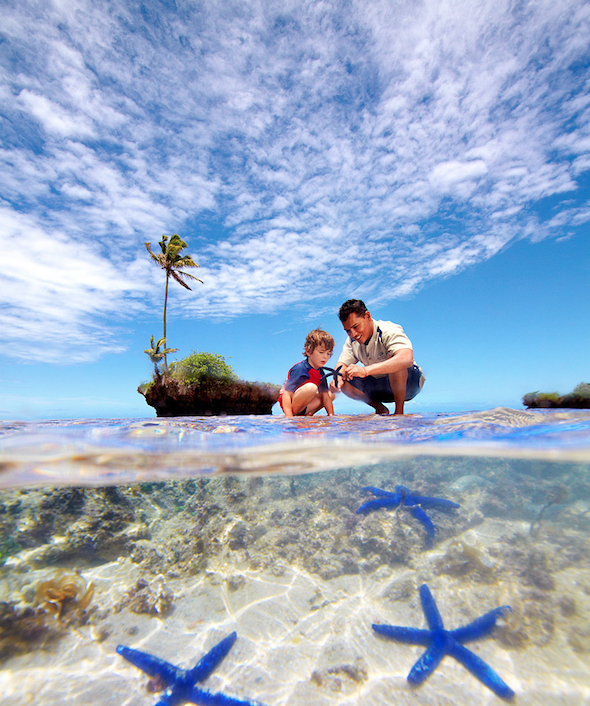 Bula Club at the Jean-Michel Cousteau Resort is an included children’s program that features a schedule of fun activities for every age of child from babies to teens. Parents will wish they were kids, too. The resort’s full-time Fijian naturalist/marine biologist (pictured below) guides Bula Club outings, providing a delightful educational experience for children. They can take part in rock pool exploration, hiking, glass-bottom boat excursions, treehouse, and more. Even new parents and parent of very young children get a break: every child under the age of five is assigned to a designated nanny (at a ratio of 1:1) for their entire stay at no extra charge. Mom and Dad can nap on the beach and rest easy. It's not just luxury, it's authentic eco-luxury travel. Jean-Michel Cousteau Resort’s philosophy is to strive to maintain nature’s balance by respecting and participating in its environment, inspired by the thousands-year-old practice of the Fijian people's interaction with their natural eco-system. At the resort, the seas provide the fish served for dinner, the trees produce coconuts that are served to the resort’s guests, and the rain sends water to flow from the tap in the bures. 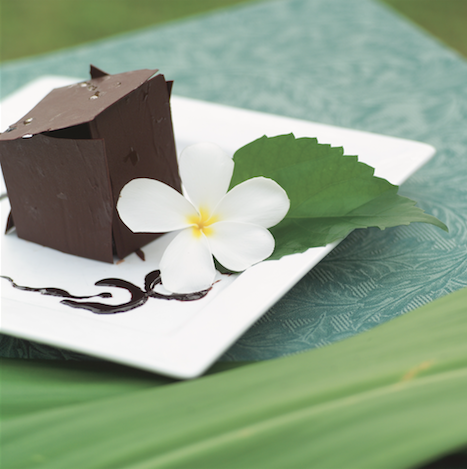 The resort also features an organic garden and resort-wide edible vegetation. The tropical fruits on your plate, including pineapple, mango, papaya, coconut, guava and more, are all harvested from the edible landscaping. True to the Cousteau heritage – the resort practices recycling and composting, and employs low-energy lighting, solar panels and environmentally-sustainable practices in the laundry and kitchen. 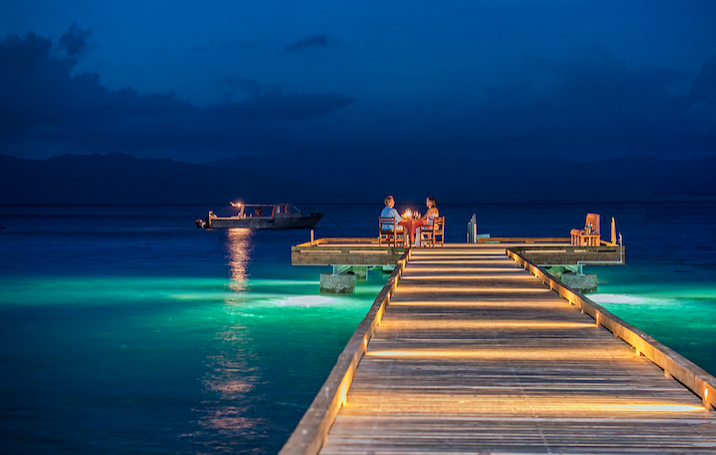 Wood used on the resort comes from certified forests, and the restaurant does not serve reef fish or farmed shrimp. A vacation at Jean-Michel Cousteau Resort is an unforgettable escape to paradise where you can soak in the natural beauty of the island, the Polynesian marine environment, and the warmth of the Fijian people, all while supporting efforts to preserve the region’s beauty and its role in sustaining our planet.